As a vegan, I am about to say something that I would have never expected to say. Ever. You see, this recipe was one that I adapted from Giada De Laurentis, aka the pork and cheese loving force behind the show (and all of the accompanying cookbooks) Everyday Italian. I promise you – I am not kidding! The other day I had the food network on TV as I was doing some around-the-house tasks. I believe the show that was on was Extreme Cakes (seriously, people- these were some pretty extreme cakes! There were firecrackers, pounds of fondant, and moving parts…) when I left the room … and when I came back, there was Giada, throwing around pancetta, mozarella, parmesean, and ricotta like these are the staples of any healthy, well balanced meal. Believe it or not, as I watched this one-woman-health-crisis go, I thought to myself, “Hmmmm….that dish has potential.” As I went about my day, I had the idea of this dish lodged firmly in the back of my head and eventually, to purge it, I had to make it. With a few adaptations, of course. For this dish I used whole wheat lasagna noodles for the first time and I was pleased with their chewy texture. I overhauled the recipe to rid it of all animal products, and I subbed in soy cheese and a modified version of Isa Moskowitz’s Tofu Basil Ricotta from Vegan With A Vengeance. The modification that I made was to puree it in a food processor instead of mixing it up by hand. I did this to mimic the smoothness of the melted cheese in Giada’s dish rather than subbing in a crumblier stand-in (which I usually use in my traditional style lasagna). I also made a smaller batch of the lasagna than the original recipe called for because I was only making dinner for two (with leftovers for lunch the next day, of course!). The beauty of this lasagna is that it is actually fairly easy to make and is ready in less than an hour, but it looks incredibly fancy and it tastes four star. Does it get any better than that? 1. Bring a large pot of salted water to a boil over high heat. Add 1 teaspoon olive oil. Add the pasta and cook until tender but still firm to the bite, stirring occasionally, about 8 to 10 minutes for dried pasta or 2 to 3 minutes for fresh pasta. Drain pasta. 2. While the pasta is cooking, rehydrate the tomatoes in hot water until tender to the touch. In a food processor combine the sun-dried tomatoes and basil. Pulse until the mixture is combined. Transfer to a small bowl. Stir in 1/4 cup shredded soy cheese. Set aside. 3. Heat 1 tablespoon olive oil in a skillet over medium heat, and the onion and garlic and cook until tender, about 4 minutes. Add asparagus and cook until tender, about 4 minutes. Transfer the mixture to a large bowl. Add the tofu ricotta, salt, and pepper and stir to combine. 4. Preheat the oven to 350 degrees F. In a 9×9-inch baking dish place three lasagna sheets, then half asparagus mixture. Next sprinkle some shredded soy cheese on top. Continue for 1 more layer. Top with lasagna sheets, some sun-dried tomato mixture, and shredded soy cheese. Dot the top with butter. Bake until the ingredients are warm and the soy cheese is melted, about 20 minutes. Crumble the tofu into a food processor. Add the remaining ingredients and process until smooth. Wow I’m surprised it’s possible to veganize Giada’s recipes. They’re always so un-friendly to vegans. Great work!! 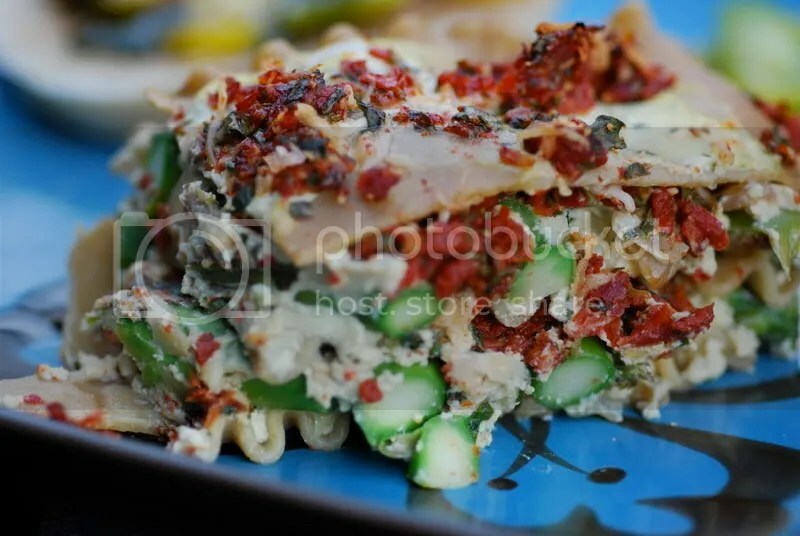 Asparagus in lasagna is something I never thought of, but who doesn’t love asparagus, and lasagna? Together…. molto buono!! I’ve got to say…this looks wonderful! I could deal with her perkiness for this…I guess. I adore asparagus. 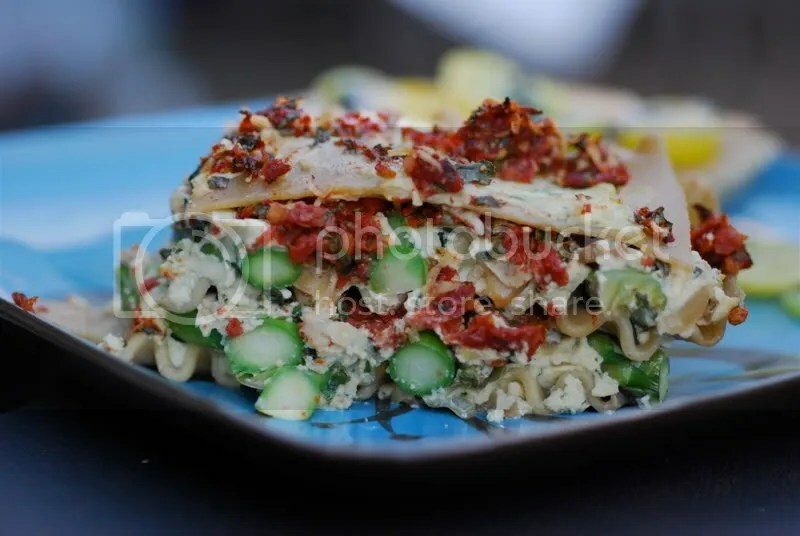 I have had artichoke lasagne which was awesome, but asparagus is not a combo I have tried. I imagine its bitterness is a nice offset to the creaminess of the other ingredients. Yum! That sounds so good! And I have to agree with you–Giada’s recipes are ridiculously unhealthy. And then you look at her all skinny and perfect and wonder if she EVER eats any of her own cooking?! How could she if she looks like she does?! I am sure your version is so much better and healthier than the original! Wow that looks so good! I have some asparagus at home…I might need to make this! The pictures are wonderful. 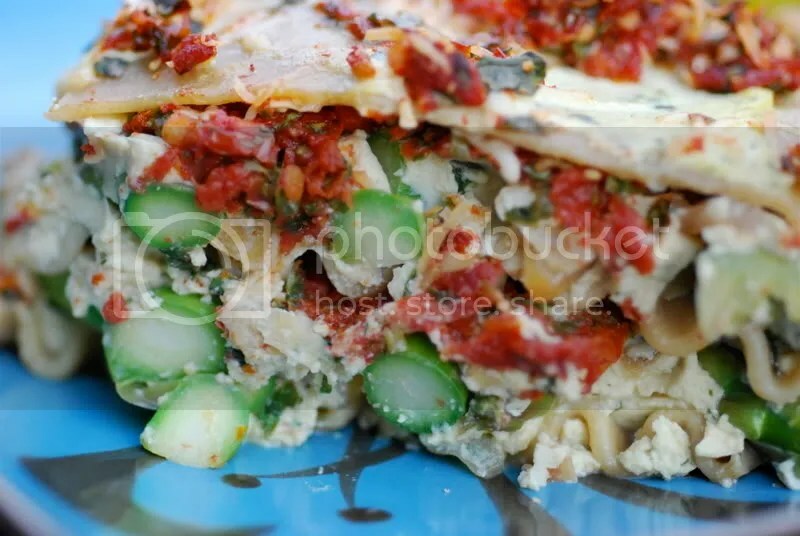 Yum – I love asparagus, but would never have previously thought of using it in lasagne. One to bookmark for future reference! Apologies if you have already done it. Romina – I find it quite satisfying to veganize the seemingly unveganizeable (!). Cakespy – I think that Rachel Ray may have Giada beat in the cloyingly annoying perkiness category. Courtney – The theory in our household is that Giada immediately spits out whatever food she pretends to eat as soon as the cameras stop rolling. Then she rinses furiously water lest she accidentally ingest calories. Regina – I hope that you enjoyed your asparagus however it ended up being prepared! Cakelaw – I haven’t been tagged yet. I had to post the DB challenge today, but I will do the meme for my next post. Thanks for the tag! Ha ha ha–I like your theory!